Jan 23, 2010 – Carson, California, USA – U.S. defenseman CLERENCE GOODSON (3) and Honduras forward GEORGIE WELCOME (25) battle for the ball. Honduras went on to win 3-1. The U.S. Men’s National Team versus Honduras. In front of a crowd of 18,626 at the Home Depot Center, Honduras wins decisively over the US with a 3-1 score. However, neither team fielded their full squad for the match. This is the first international friendly of 2010 for both FIFA World Cup-bound teams. USA Soccer picks up an important win against El Salvador at home in the 2010 FIFA World Cup Qualifiers. With just 4 games left and 3 points separating the top 3 teams in the qualifying group, the three points from the win will play a critical role leading up to the World Cup. Mania, originally uploaded by LeRamz. Adi Dassler registered his company on August 18th,1949 and since then adidas has a long history with FIFA and Soccer/Football. adidas was the first to introduce screw-in studs in 1954 worn by the players of the FIFA World Cup winning German national team. 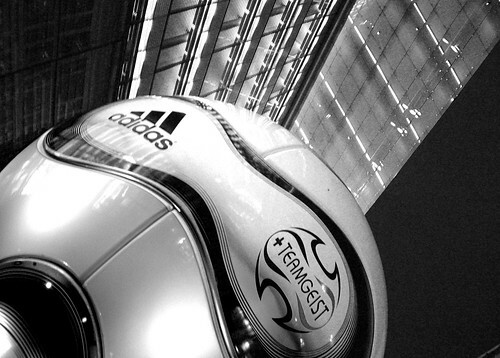 In 2006, adidas introduced the first 14-panel configuration forming a smooth round exterior allowing significant improvements in accuracy and control for the FIFA World Cup in Germany. Check out their site for more adidas history or download their PDF, 60 years of adidas – the stories that still inspire us today.